Most PowerPoint presentations have slides that include a bulleted list. 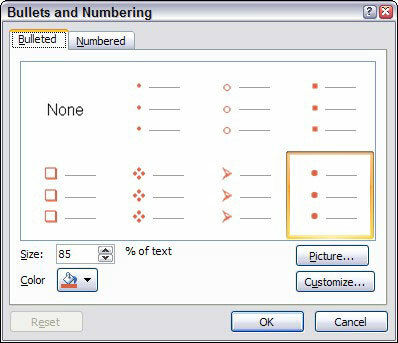 PowerPoint 2007 comes with bullet styles, making the creation of your bulleted lists easy. 1Highlight the paragraphs to which you want to add bullets. To add a bullet to just one paragraph, just place the cursor anywhere in the paragraph. 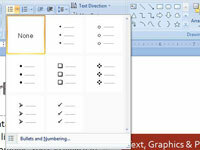 2Click the Bullets button in the Paragraph group of the Home tab. Click the Bullets button once to add bullets and click it again to remove bullets. Click the Bullets button down arrow. 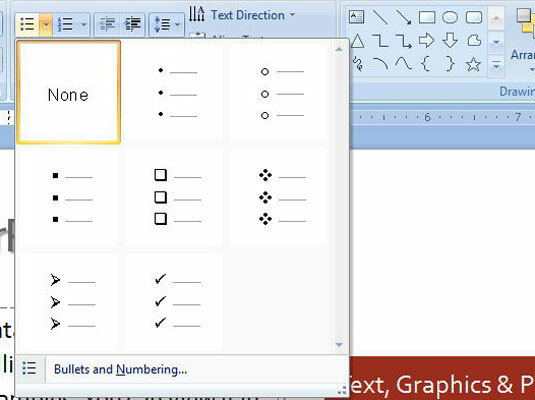 If you don’t like the appearance of the bullets that PowerPoint uses, select a different bullet character, picture, or even a motion clip by following these optional steps. 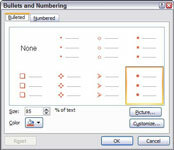 4Open the Bullets and Numbers dialog box. 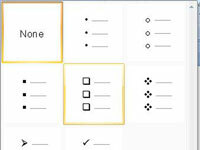 Click the arrow at the right of the Bullets button and then choose Bullets and Numbers. Then choose a bullet character, change the bullet’s color, or size. This displays a dialog box full of useful alternative bullet characters, such as pointing fingers, a skull and crossbones, and a time bomb. 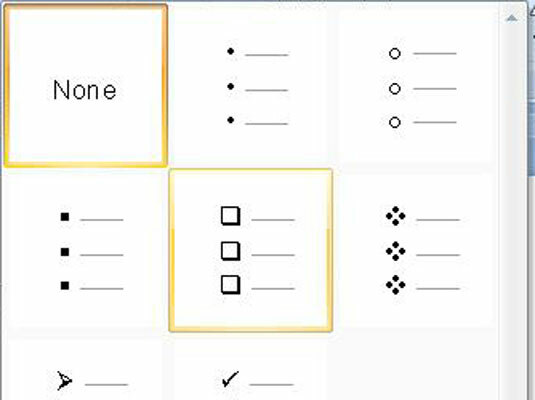 Pick the bullet that you want to use and then click OK.
6Use the Color drop-down list. Colors from the current color scheme appear in the drop-down menu that appears. For additional color options, choose More Colors. 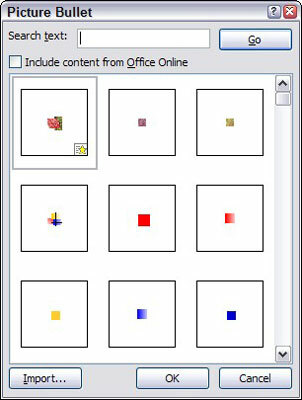 This opens the Picture Bullet dialog box. Select the picture that you want to use for your bullet and then click OK.